Our last deep-dive into Sears Holdings (NASDAQ: SHLD) (Sears) detailed the operating and financial difficulties facing the retailer. While many industry watchers were doubtful of the company’s ability to even make it through the 2016 holiday season, we offered our prediction that mid-2017 would be the timeline of severe risk for stakeholders. It turns out that the business has managed to survive through all of 2016, but financial risk has increased substantially over the last few quarters. As subscribers already know, Sears holds a FRISK® score of 1, the lowest possible score on the 1 to 10 scale. 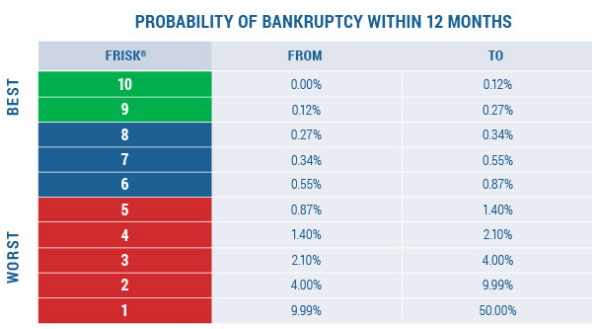 This score represents severe financial stress, as measured by a 10% to 50% chance of bankruptcy within a twelve month timeframe. However, the risk of failure for Sears has shifted from the low end of that range to the high end as 2016 drew to a close. In the last few weeks, Sears obtained additional liquidity through two new debt contracts and an agreement to sell the iconic Craftsman brand to Stanley Black & Decker (NYSE: SWK). These strategic actions should improve near-term liquidity, but we believe the capacity to avoid financial distress has only shifted modestly. Why? It simply ties back to the retailer's chronic operating losses and a rapidly deteriorating capital structure. The company also faced a decline in product sales across a variety of categories, which underscores the lack of demand for the company's branded products. These problems are buttressed by weak mall traffic trends, and issues specific to Sears, such as lower advertising spend and limited in-store investment. Given that third quarter sales revenue declined faster than operating costs, poor performance is a top concern, particularly given how much time management has been working on the retailer’s turnaround efforts. In addition, the divestment of the Craftsman brand, meanwhile, would suggest lower future margins from the sale of Craftsman products. Next, let’s look into the upcoming fourth quarter. Overall, there should not be a large cash outflow given the normal seasonal reduction in inventory for retailers. For context, in 2014 and 2015, Sears saw cash boosts from inventory reductions in the amount of $1.52 billion and $1.04 billion, respectively. However, we expect that inflow should fall considerably given that the company reported same-store sales declined between 12% and 13% during the first two months of the fourth quarter. This disappointing trend also suggests that Sears likely discounted even more aggressively through the end of the all important holiday selling period in order to move products off the shelves. That would be problematic as the company works into the following periods and cash requirements pick up again. Take note that this leverage snapshot does not include the recent additions of the LC facility and/or the senior loan facility obtained in late December and early January. We also believe it is worrying that the company has seen multiple executive departures in the last several months. The list includes the Chief Financial Officer, President, and Senior EVP. Although there are likely to be specific reasons for each person's departure, a slew of high level resignations collectively are a sign of serious trouble. With this negative backdrop, the question of alternatives comes into play. In the third quarter investor presentation, Sears noted that it had 430 company-owned stores. Fitch Ratings stated that the company only possessed 250 unencumbered stores as of November 14, 2016, and offered the opinion that the market value of this remaining portfolio was difficult to estimate. At the end of the third quarter, total liquidity stood at approximately $432 million, with $258 million in cash and $174 million on the credit revolver. In late December, the company secured a letter of credit facility with an initial availability of $200 million, and a contingent $300 million that would need to be approved by lenders. Following that, Sears also obtained a secured loan facility in the amount of $500 million, $321 million of which is currently being used and is collateralized by another 46 properties. If the remaining $179 million is drawn upon, this balance would also have to be secured by additional properties, resulting in even more encumbered real estate (management did not disclose the potential number). So while Sears management suggests it would be able to retrieve proceeds approximating $1 billion from its outstanding real estate, the question remains: How many unencumbered stores does the company actually have left? On the positive side, Sears did achieve one stated goal, finding a buyer for Craftsman. This $900 million deal will generate $525 million in cash up front with the remainder paid over time, which should fulfill certain obligations. However management has not yet found buyers for its Kenmore and Diehard brands. Active interest in this pair could remain muted despite the reputation of these brands as bidders may await more depressed valuations. This viewpoint holds merit, in our opinion, given an extremely difficult retail landscape and Sears' increasingly weak financial state. All of these moves have boosted the current cash position, which year-end sales should demand, but the company's leverage has also increased considerably as well. In the end, if business trends don't improve, this added debt load could end up further limiting the company's future options. It’s also worth noting that several of the company's bond issues are selling below par value, which suggests heightened concern from debt markets. Sears offered the notion that all future funds are essentially being utilized to transform the company to be more customer-focused. But the chances of a recovery are increasingly remote in our opinion. Traffic declines, burn rates, and the negative trends in other key performance metrics look far from healthy, suggesting that, as some market participants have put it, it might be too late to turn the ship. We still believe that the next few quarters will be a period of profound financial stress for Sears and its counterparties. If that includes you, now is the time to start preparing. FRISK® Stress Index is a model that provides the average probability of failure for a group of companies (e.g. by industry, portfolio, or country) over the next 12 months. The level of risk is measured through a scale of 0 to 50, with 50 being the most risky.